I am a pratidhawani grahak, but I am not known my grahak no. and I am not receiving pratidhwani regulary. This year I also want to be a grahak of Pratidhwani, please some information. JOYGURU. I am very very much inspired by 'SAMABETA UPASANA'. To my view, only this programme of about 2 hrs. may bring Holy change in any one's live. It is indeed a very good initiative to capture all relevant information of the Pholosophy and the message which Babamoni wanted to spreadout across the world.I am 1986 Batch pass out from The multiversity,Pupunki Ashram.SO, all this Bani,songs etc. are very close to my heart.I don't know ehether it is right forum or not...Can't we revive the Pupumki Ashram which was Real factory for implaning the seed of Charitragathan across human society.I knwo it needs huge People and Finance support.But ca'nt we think for this Noble cause. It is my great pleasure to browse the wave site pertaining to Babamani. Feel great pleasure that the philosophy of Sri sri babamani is focous in the net. Thanks a lot who has arranged the space by the grace of lord swarupananada. 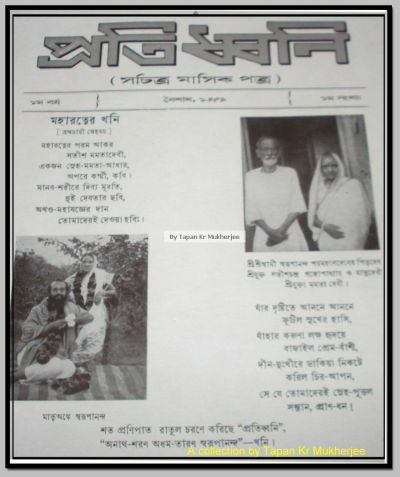 Take my souly pranama and help me to contribute in the world of Babamani's true vision. we are very happy to get such web site.In future we will contact with you. I WOULD LIKE 2 COMPLIMENT THE PERSON WHO HAS PUT TOGETER THIS WEBSITE, MY HEART FELT GRATITUDE. ITS ABOUT TIME THAT SOMEONE HAS TAKEN ON THE RESPONSIBILITY TO LET THE WORLD KNOW ABOUT OUR GURU DEB'S MISSION. I HOPE THIS IS THE START OF A WONDERFUL JOURNEY FOR OUR GURU DEB'S MISSION. I FEEL PEOPLE HAVE WAITED LONG ENOUGH TO HEAR ABOUT OUR DEAR GURU DEB & HIS WONDEFUL MISSION. 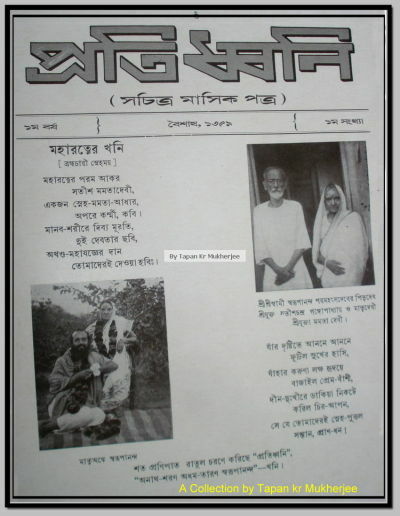 Few extracts from the magazine "Pratiddhani" publshed here. Let us hope the magazine will republish again and the motto of Babamani will never stop.